Attractive colors have its own charm and when these colors are covering any gadget then it make the looks of the gadget awesome .Yes , I am talking about the new Hard Disk Drives which are Rubberized siding and clean lines , having storage size from 320 GB to 500 GB from LG. Gadgets come everyday, but the one which offers something different and with a new style remains in our minds. Samsung has introduced their new ‘point-and-shoot’ camera, which has a very retro appeal to it. There are two dials on the top of the camera, which display you battery and memory left and they look like the fuel display of cars. The cam looks overall very impressive and has some good features in it. The next big thing is most definitely the next big thing and there is certain rise of green products now. Auto industry is up to making some green cars as well as the mobile industry is coming up with great green mobiles. The most used gadgets, are music players like Apple iPod which are mostly used by teenagers. So whats better than targeting the music players and making them all green. 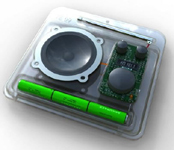 Designer Klaus Rosburg comes up with a green idea of a radio. The radio would have a transparent look and it would be made up from PLA which is a s biodegradable, thermoplastic, aliphatic polyester extracted from renewable resources like cornstarch and sugarcane. Plants are good for the environment and a lot of campaigns are undergoing for this very cause.In modern day life we have forgotten the importance of ‘green’,and we just don’t care much of how many plants are needed to grow for keeping a sound environment.There are a lot of species in plants and need different surrounding to grow.To help you find the best place to grow a plant,this new gadget ‘Easy bloom Gardener’ would be a handy treat. Concepts in technology are very important,as they take our minds away.Flying in a plane was once a concept which changed how we imagined traveling.An engineer in Japan has gave the concept of a motion controlled mp3 player and now has made a prototype of it ,which enables you to change your songs just with a direction tap.Now this could change our imagination about song change :).Below you can see the amazing prototype working video. Aren’t you amazed to see the secret spy tools super detectives use in movies,like James Bond etc.I am always in look for some real-time spy tools because they are fun to have and give you a cool feel ;).Today,i want to share this amazing new spy pen,which gives you a total control of spying on someone. Sertified 2GB USBs Rock On !! USBs are the most useful gadget made in the history of computers,aren’t they ! !.I love USBs which are stylish and look different from the usual.You may have seen different USBs.Sertified has launched its new USB made in the shape of hands.The USBs have a storage capacity of 2GB. Author VickyPosted on January 15, 2009 January 15, 2009 Categories Computers, Electronics, Gadgets, Hardware, TechnologyTags computer, data, Gadget, Portable, usbLeave a comment on Sertified 2GB USBs Rock On !! Samsung made a good show at CES2009 today, by introducing two high tech products, the Luxia LED HDTV and Samsung P3. Samsung P3 is a new touchscreen multimedia player. The P3 has a WQVGA 3-inches touch screen which gives a wide space for the users to play around. P3 shows you the high quality images and videos in 16:9 ratio. And yes, the feature that iPod does not have – A speaker! Samsung P3 has a built in speaker so that you can enjoy your rocking music load and clear. A new conceptual mobile phone handset has been presented. It is a slider mobile phone handset and both the top and the inner part of the mobile is a touch screen. The main Screen and the inner dialpad (usually buttons) are also the touch screen. Look at the photos of this conceptual dual touch screen slider mobile phone handset.